This week is one of the biggest ones of the entire season as the eyes of the National Hunt world fall on Aintree for the Crabbies Grand National Meeting. There are three days of stunning sport to take in before the Grand National itself takes centre stage on Saturday afternoon with the whole nation set to tune in for one of the biggest sporting events of the year. We have put together a handy A to Z guide for the Grand National Meeting that should hopefully appeal to the more casual punter as well as the hardened racing fan. A writes itself with the Grand National meeting taking place at the world famous Aintree Racecourse. Located on Merseyside, Aintree has two courses, the Mildmay and the National course and hosts the National itself every season. The Chair is the tallest and perhaps most famous fence on the Grand National course. The Chair is jumped once in the Grand National and is situated just in front of the main stand as the 15th fence of the famous race. Who can forget Don't Push It winning the 2010 Grand National as the legendary Champion Jockey AP McCoy finally won the race on his 15thg attempt. 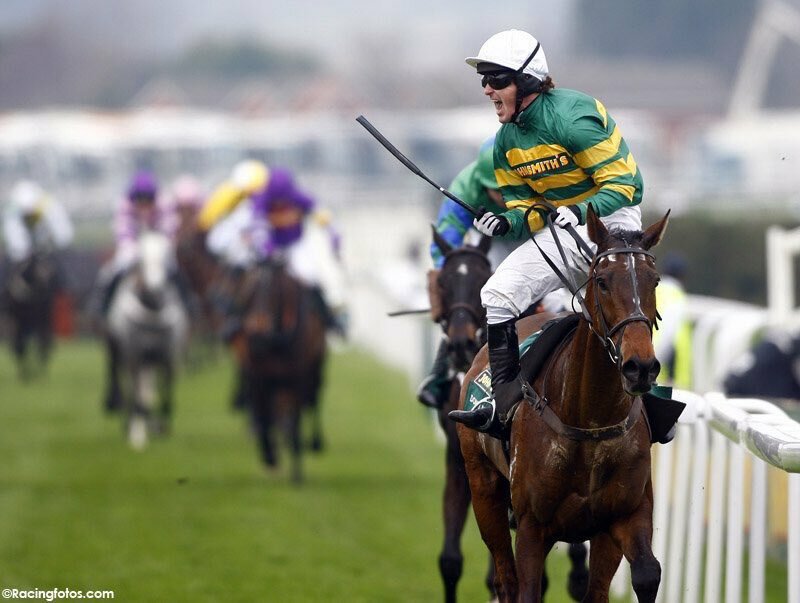 McCoy would go onto win the SPOTY the year award thanks to the famous triumph of the Jonjo O'Neill trained Don't Push It. The #GrandNational is 6 days away. Esha Ness wrote his name into the National history books in 1993 when he won the race that never was. Despite a false start having been called, 30 of the 39 jockeys failed to notice and completed the entire race with Esha Ness claiming the win. The race was declared void. The 1967 Grand National, won by 100/1 shot Foinavon, will go down in history as one of the most amazing races of all time. Out the back for much of the race, Foinavon took advantage of a pile up at the 23rd fence (now known as Foinavon) which left the rank outsider to cruise to the front and take a famous victory. George Stevens is the winning most jockey of all time in the Grand National. Stevens won the race five times during his career in 1856, 1863, 1864, 1869 and 1870. Hedgehunter was one of the more popular winners of the Grand National back in 2005 and is among the best aintree horses of the modern era. Having fallen when going well in 2004, Hedgehunter won the race in 2005, he finished 2nd 2006, 9th in 2007 and 13th in 2008. The Grand National has been won by Irish Trained horses five times since 2000 but not since Silver Birch won the race in 2007 for Gordon Elliott. The highest placed Irish finisher in 2015 was the Elliott trained Cause Of Causes who finished 8th. The horses often get the limelight but the jockeys in the Grand National are often putting their body on the line. The men and women in the plate often suffer bad injuries in the race and deserve massive recognition. Lottery is in the record books as the first ever Grand National winner back in 1839. It was run under the name the Grand Liverpool Steeplechase and Lottery came out on top of an 18 runner field. Mr Frisk won the Grand National back in 1990 and to this day he still holds the course record thanks to his famous win. The Kim Bailey trained horse won the race in 8mins 47.8secs. Neptune Collomges won the 2012 Grand National in the closest finish in the entire 165 history of the race. The grey horse was closing in on Sunnyhillboy on the run in with every stride and as the the horses crossed the finish line, they needed a photo finish to separate them. Peter O'Sullevan retired from the commentary box in 1997 but remains synonymous as the voice of the Grand National. He called home the majority of the legendary winners during the latter half of the 20th century and he remains a legend of the sport. Peter Simple was the Grand National winner in 1853 at the age of 15 and he still holds the record as the oldest ever winner of the race. No horse older than 13 has won the race since and the record of Peter simple is unlikely to be broken anytime soon. The Grand National is a massive sporting and social event each year and thousands pack into Aintree for the big race. It is always a great day but expect a queue at the bar! Red Rum is without question the most famous Grand National horse of all time with three wins in the race to his name. 'Rummy' ran in the race five times winning three times and coming 2nd twice. No horse has won the race more than once since. The Sefton Novices Hurdle is a Grade 1 contest run over 3m at the Grand National meeting each year. Recent winners include Thistlecrack, Beat That and Saint Are, who has since finished 2nd in the National itself. Trevor Hemmings holds the joint record as the winning most owner of the Grand National with Noel Le Mare and James Octavius Machell. Hemmings has won the famous steeplechase three times with Hedgehunter (2005), Ballabriggs (2011) and Many Clouds (2015). No race is tougher for horse and Jockey than the Grand National and the number of jockeys on the floor in this race is always high. The Druids Nephew unseated Aidan Coleman five out in 2015 when going really well in just one example of a unseated National jockey. The Valentine's fence during the Grand National is taken in twice during the race and was named a such after a horse named Valentine was reported to have jump the fence, hind legs first in 1840. West Tip will go down in history as one of the best Grand National horses of all time. The Michael Oliver trained horse ran in the race in six consecutive years which is impressive enough but his most famous moment came in 1986 when he won the race. The youngest jockey to win the Grand National was Bruce Dobbs who won the famous race at the age of 17 back in 1938. Hobbs rode Battleship to victory in the race and actually also won the Welsh Grand National on Timber Wolf just two weeks later. Z was never going to be an easy one but when you trawl the record books you find the name of Zoedone. The 6-year-old won the race all the way back in 1883 carrying 11st on his back and other than that, there is nothing significant about her win. Odds correct as of 10th Apr, 20:00 . Odds are subject to change.